Having someone form a record label specifically to promote your own product, has to be the ultimate form of flattery. That was precisely the case when Ezekiel Christopher Montanez came under the wing of producer Jim Lee at the beginning of 1962. That first song they made together is now 55 years old, it’s been a UK hit four times, three of them for its originator and once for a couple of radio bods. Ezekiel Christopher Montanez was born in January 1943 in Los Angeles and grew up in nearby Hawthorne in a musical family. His brothers taught him to play guitar and at 15 he began to sing and write songs. He had attended the same school as the Beach Boys and recorded his first song, She’s My Rockin’ Baby. 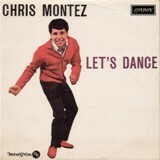 He idolised Richie Valens so he changed his name to Chris Montez and began performing in a style reminiscent of his hero. Whilst some producers had been hoping to find another Buddy Holly in the wake of the February ’59 plane crash, Jim Lee set about searching for the man who’d adopt the mantle of Ritchie Valens. Chris Montez was that man, and following a regional breakout of his first single, Jim spotted him in a club and signed him up. He also formed the Monogram record label on which to issue Chris’ records, the first being All You Had to Do (Was Tell Me) / Love Me, both sides co-written by Montez and Barry DeVorzon. Jim wrote the follow-up, Let’s Dance and gave it to his new protégé. The song highlighted many of the dance crazes of the day like the Stomp, the Mashed Potato, the Twist and the Wahtusi. The original vinyl single was a real thumper and featured Ray Johnson on Hammond organ, Joel Hill on guitar, Ray Pohlman on bass and Jesse Sailes on drums. The CD remastered version just don’t have that same scope and sound that the vinyl provided. It was Ray Johnson’s raft of major 6ths elicited on a neatly draw-barred Hammond B3 that made the single shine like gold. Whilst Let’s Dance was riding high in the chart, Montez toured America with former Drifter Clyde McPhatter and Sam Cooke and the following year he came to England and toured around Liverpool with Tommy Roe and even headlined a concert with the Beatles as support. By the time the tour reached London, Roe and Montez soon realised that it was almost impossible to follow the Beatles, so both of them dropped to second billing. Chris recorded the album Let’s Dance and Have Some Kinda Fun and from it two more ‘dance’ tracks were released, Let’s Do the Limbo and My Baby Loves to Dance but neither troubled the record buyers. By January 1963 Chris was back in the UK top 10 with Some Kinda Fun. Switching from rock and roll to middle-of-the-road in 1966 he had one further top 10 hit with The More I See You. Let’s Dance had staying power, exactly 10 years after its original release, it was re-issued to celebrate the anniversary and was back in the top 10 again. There was one further re-issue in 1979, following its use in the 1978 film National Lampoon’s Animal House which starred John Belushi, this time backed with Lonnie Mack’s Memphis, but stiffed at number 47. In October 2002, Chris went on a tour of England, Ireland, and Wales with various sixties artists including Bobby Vee and Brian Hyland. In April and May this year, Chris was back on tour in the UK this time with Mike Pender, Dave Berry, Wayne Fontana and The Merseybeats and were all backed by the New Amen Corner. By the way, that cover I mentioned earlier by a couple of radio bods was Bruno (Brookes) and Liz (Kershaw), together with the DJ Posse (whoever they were) which spent one week at number 54 in 1990.